Faith has been running Harmony Singing workshops since the late 1980s and is a founder member of the NVN. She works under the company name Singing for Larks, running her own regular groups, one off days and weekends countrywide. 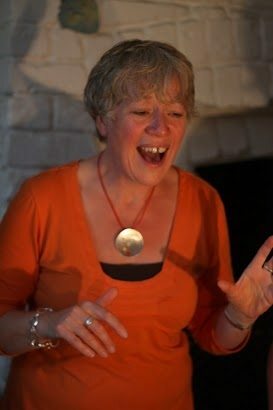 She also delivers workshops for social, health, educational and corporate organisations as well as for amateur and professional singing groups, choirs and theatre groups. Her particular interests are Jazz and Swing Harmonies and Harmony Improvisation. She writes and arranges many of the songs she teaches.. Faith offers training and mentoring for aspiring, new and established workshop leaders. Faith is a member of the acapella group The Lovenotes, with Katherine Watson (no relation) and fellow NVN members: Jules Gibb and Rose Hodgson, They often perform with jazz / blues singer, Helen Watson (also no relation!) The Lovenotes offer workshops as a group. They have 3 CDs available. At the heart of all Faith’s work there remains a love of acapella singing and the belief that everyone, no matter what their level of skill, confidence or experience, can enjoy the thrill of singing in harmony.